Fota House & Gardens: Summer is Here! Summer has finally arrived! I should probably *knock wood* when I say that, but I’m still basking in the glow of a glorious, sunny Ireland. A friend was visiting from out of town, just for the afternoon, and arriving by train. She loves little doggies and my little doggy loves her. The weather was predicted to be sunny and warm all day. With all those factors in mind, the choice of activity was clear: we would all hop on the light rail and head to Fota House & Gardens! In Ireland there are more limitations on where you can take doggies than in many other European countries, though the rules are often more flexible than the US. I can take my little fella to the post office, the bank, the chemist (pharmacy), hardware and sports shops (we’re usually after buying squeaky toys and tennis balls, respectively), and most pubs that have an outdoor area. Unfortunately, and even though he is a small guy, he isn’t allowed on the bus. He IS, however, allowed on the train! So as soon as my friend’s train pulled in on one track, we got ready to leave on another. Unfortunately, hers was late and, being the middle of the day (non-commuting hours), the light rail only ran once every hour. We missed it! We might have been able to catch it had we been more professional travel blogger-y about it and checked the times in advance, but I think we were distracted by the shiny ball in the sky. We filled the time by taking my very wiggly, energetic dog for a walk down to the river, then back to the station, while catching up and generally enjoying each others’ company. Should you fancy a longer stay than a single afternoon, your accommodation options run from camping to luxury spa resort and golf club. (Find more info on Fota here.) I’m totally not receiving any sort of perks from them, by the way. I just love going there. Cork is so adorable! There is a cafe at Fota House with indoor and outdoor seating. However, the blazing sun being a rarity in Ireland, as you might imagine, the outdoor seating had no umbrellas to keep us from melting. The staff was lovely, however, and kindly allowed us to take our food and plates out to the gardens to sit in the shade. One of them even carried a tray for us. We dined al fresco, sitting directly on the flower-speckled lawn in the shade behind the house. I ordered a salad with blue cheese, candied walnuts, and pear. 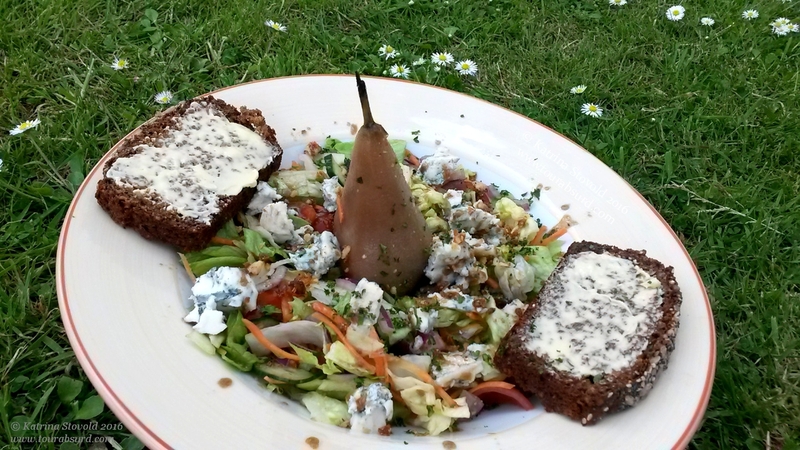 It came served with the ubiquitous and delicious brown bread found all over Ireland. We also had lovely desserts and chilled, sparkling water. It was absolutely delightful! My visitor’s phone has a superior camera to mine. She also, admittedly, has superior photography skills. She graciously granted me permission to post a bunch of her flower pics here. You can find her posting beautiful pictures of Ireland country life and her adorable pooches at @WildCottage on Twitter. We meandered around the gardens for a good long while, enjoying the sun, sniffing the flowers, and generally being delighted. 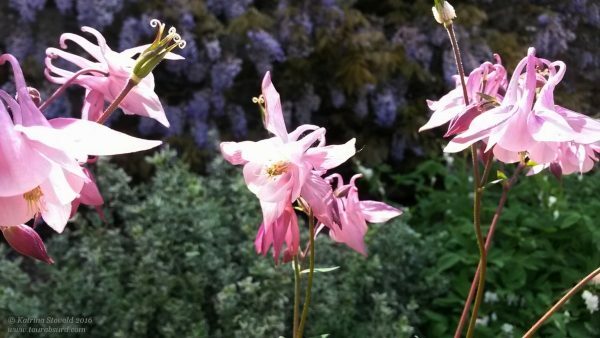 My friend knew so much about the flowers and their names I was in awe. There were a few she couldn’t quite put her finger on, but with all the pictures she took, I’m sure she and Google will get it sorted before too long. After responsibly checking the clock (we had re-learned our travel skills) and allowing ourselves a large lazy-summer-afternoon-strolling time buffer, we made our way back to the train. The doggy trotted leisurely along, tongue happily lolling, and seemed as blissed out as we were. Alas, although we had indeed allowed for plenty of time to catch one of several commuter trains, we watched as one heading back to Cork pulled away as we approached the platform. D’oh! Lesson only partially learned, it seems. Still, it meant more time sitting, chatting, and musing about our wonderful day. 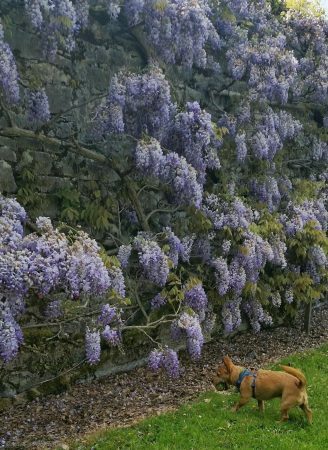 Tiny & intrepid tennis ball carrying terrier investigates the mysterious wisteria! He is adorable, if a wiggly, barky handful at times. If you’re a fan of tiny dogs, he has his own Instagram account: Gobi the Terrier! If you make it to Ireland for a bit of tourism this summer, I know you’ll be tempted to see the major tourist attractions listed in the big bus tours. They’re worth seeing if you want to tick things off your list, all right. But to really get a sense of the magic of this tiny island, spend a lazy afternoon or 3 in County Cork. Pop into Fota House. It’s the perfect place to stop and smell the flowers!